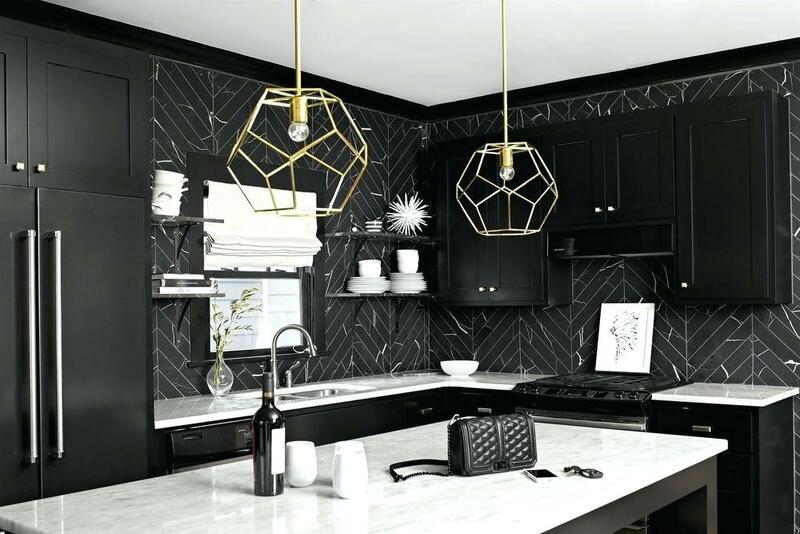 While many people enjoy the look of a light color scheme in the kitchen, those who want to make a bold statement will often turn to the timeless elegance of black. This is a common color found in our wardrobe and lots of interior designers have managed to successfully use it as a dominant color for a complete room makeover. 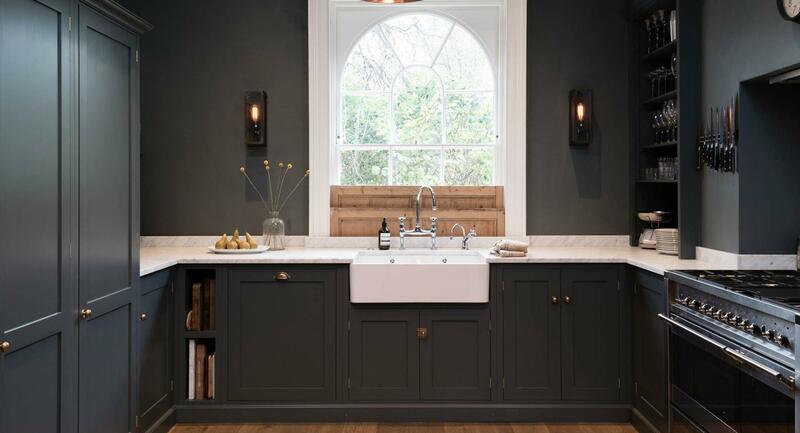 Kitchens can be transformed with inky shades of black in various ways, from cabinets to backsplashes and other decorations. 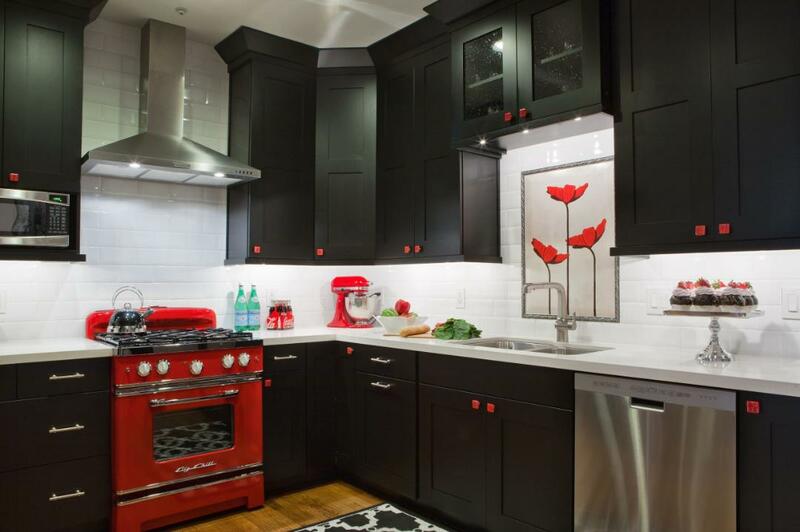 If you like the idea of designing a kitchen with a black theme, check out the following ideas. 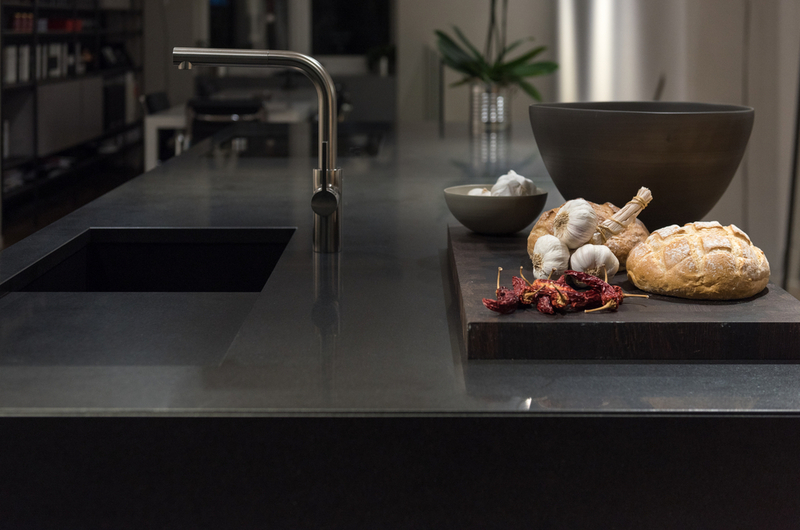 We’ve selected some of the most stunning black kitchens to give you some inspiration and add a sleek and sophisticated style to your own kitchen. Maybe a seductively dark redesign is the right choice for you. Black has certain qualities that make it very suitable for a modern environment. This kitchen looks incredibly attractive considering the sleek mix of black elements with chrome accents from appliances. The presence of a kitchen island with bar stools completes the ultra-modern vibe of this elegant room. 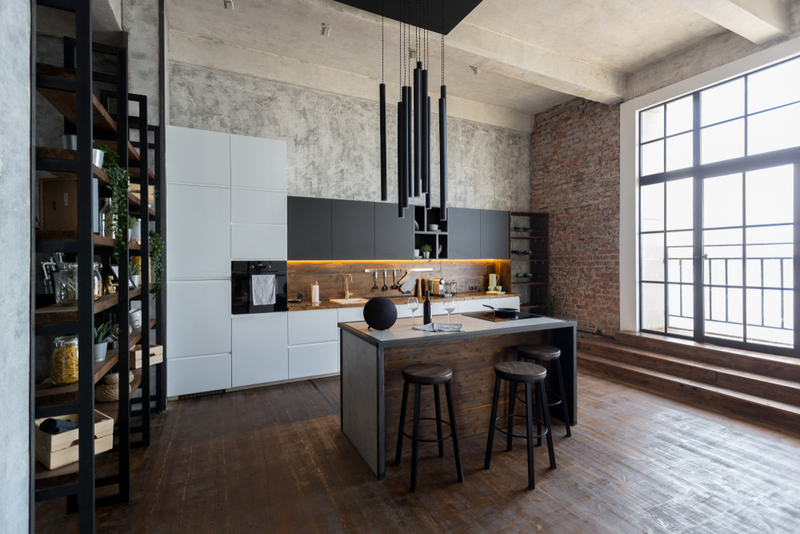 Those who prefer the industrial style can make use of decent amounts of black in the kitchen. The dark cabinets here contrast nicely with the white ones. 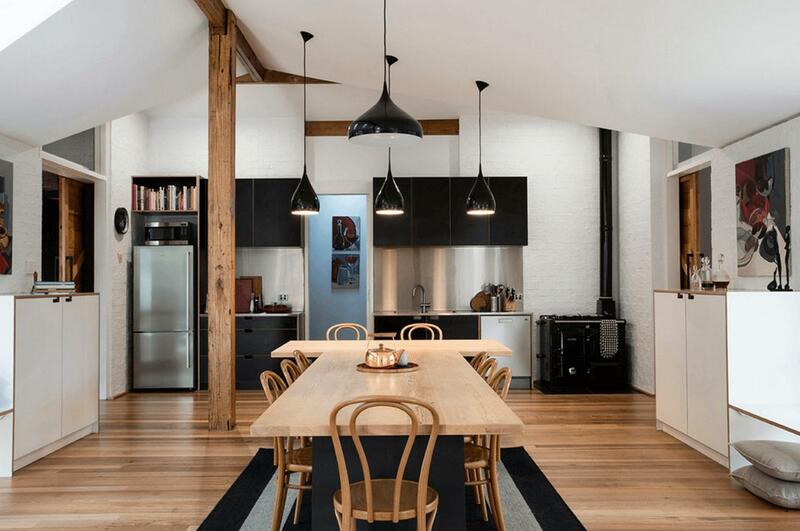 Their minimalist look becomes warmer and more inviting with the help of the exposed brick wall and the wooden floor. One of the highlights of this black kitchen is the moody lighting fixture that’s very eye-catching. 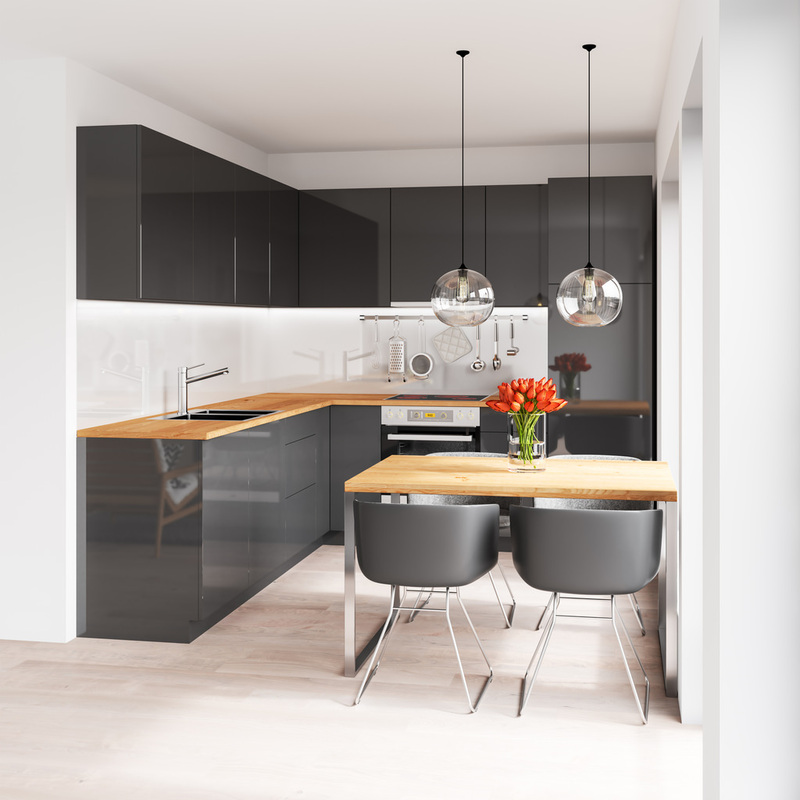 While most people imagine a very minimalist look when they think of a black and white kitchen, there are other possibilities to create a monochromatic look. This is a nice example as the black and white tones mix together very harmoniously. The glossy effect of the cabinets brings in some modern vibes while the artistic backsplash adds some visual interest to prevent the kitchen from becoming too austere. When designing a black kitchen, creating a very gloomy space can become a problem due to the visual effect of dominant dark shades. To avoid this, it’s recommended to consider the amount of sunlight that the kitchen receives. A large window can remove some of that gloominess as it bathes the black kitchen in shiny natural light. The marble countertop also contributes to brightening up the kitchen a bit and keeping it sophisticated and balanced. 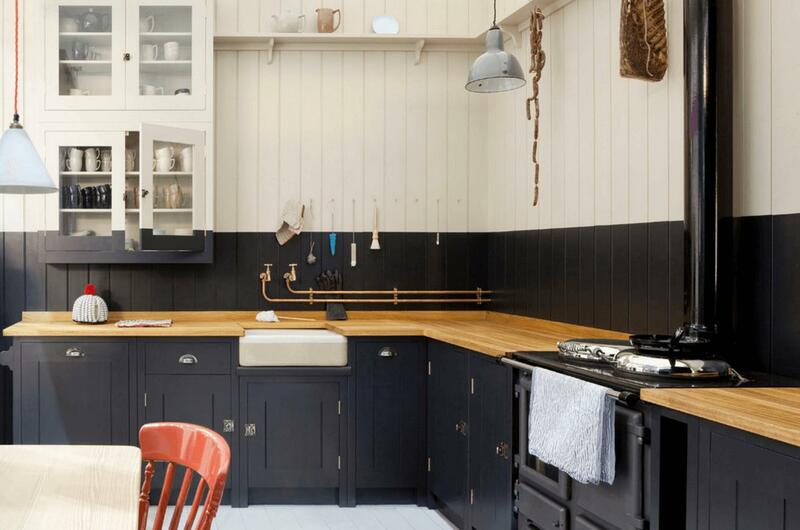 If you plan on making a traditional-looking kitchen, there’s still some room to integrate black. This classic English kitchen takes advantage of black to create a two-toned backsplash that goes over the lower cabinet to create an eclectic effect. That’s definitely a unique way to add black in the kitchen and all it takes is a bit of paint and creativity. 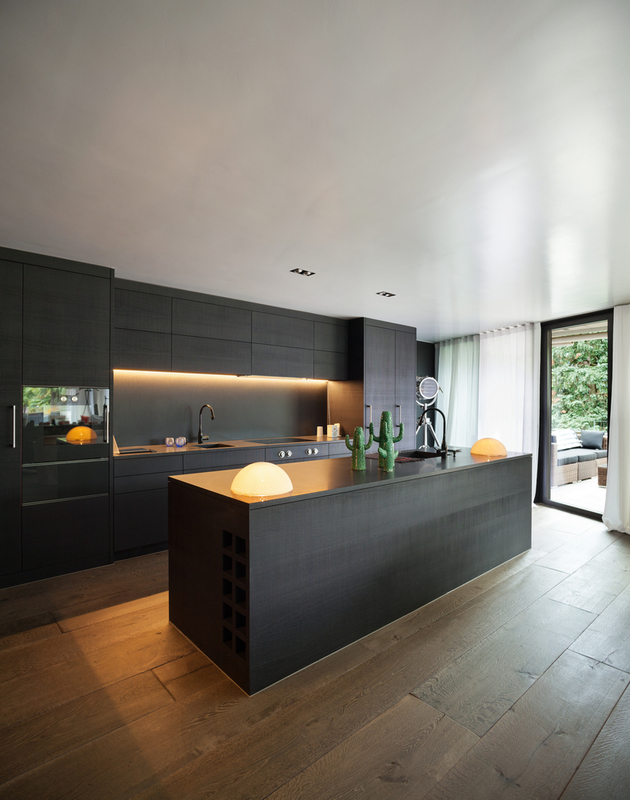 Wood seems like a good match for the black elements of a kitchen as it has the ability to soften things up. Its warm hues from the floor and kitchen island work very well together with the dark cabinets, lighting fixtures, and bar stools. Visual balance is achieved in terms of color and overall design considering the sleek black lines that look beautiful against the wood color. There’s no need to go all the way when you’re designing a black kitchen. A few elements and accents will add just the right touch of blackness without disrupting the cozy atmosphere. This is a Scandinavian-style kitchen that mixes the old with the new for a refreshing look that’s both rustic and elegant. If you’re undecided about going for a matte finish or a glossy one for your black kitchen why not try to combine these two looks? This is what the interior designer for this kitchen probably had in mind. 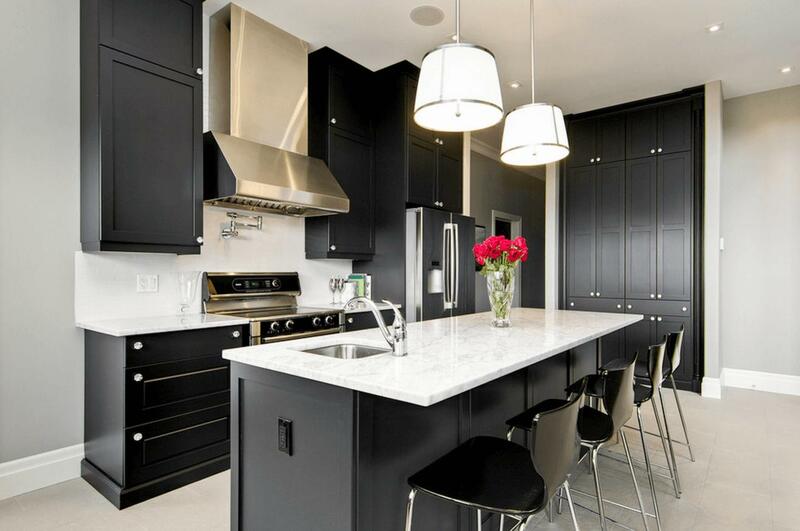 The matte effect from the black cabinets looks very stylish when paired together with the glossy tile backsplash. It’s also interesting how the subway tiles have a vertical design to break up the usual conventions and create more visual interest. The mixing of different elements doesn’t stop here, as this black kitchen combines metals like brass from the cabinet knobs with chrome from the faucet for an unexpected effect. An excellent accent color to add to your black kitchen is this mustard yellow shade that infuses the space with some pleasant warmth. This attractive shade of yellow offsets the dark walls. The modern overall look benefits from some extra coziness coming from the terracotta brick floor. 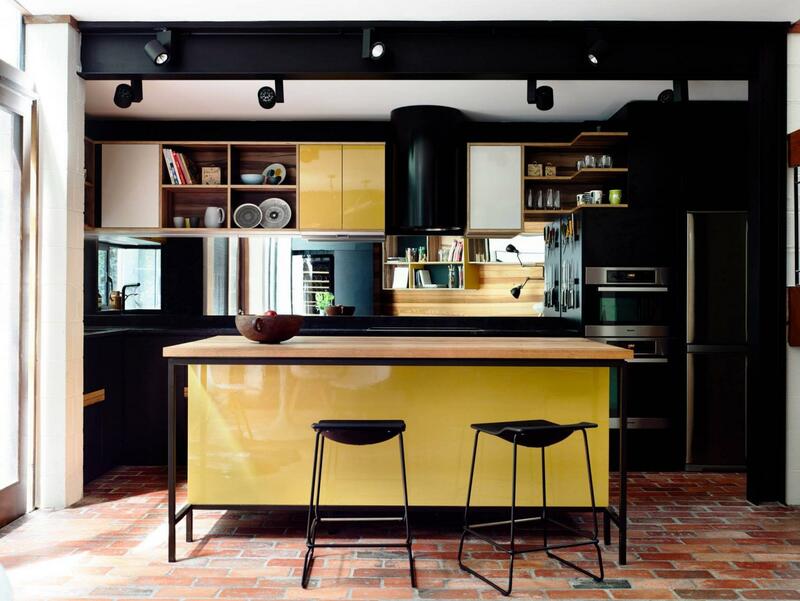 The combination of mustard and black colors gives this kitchen a subtle retro vibe. 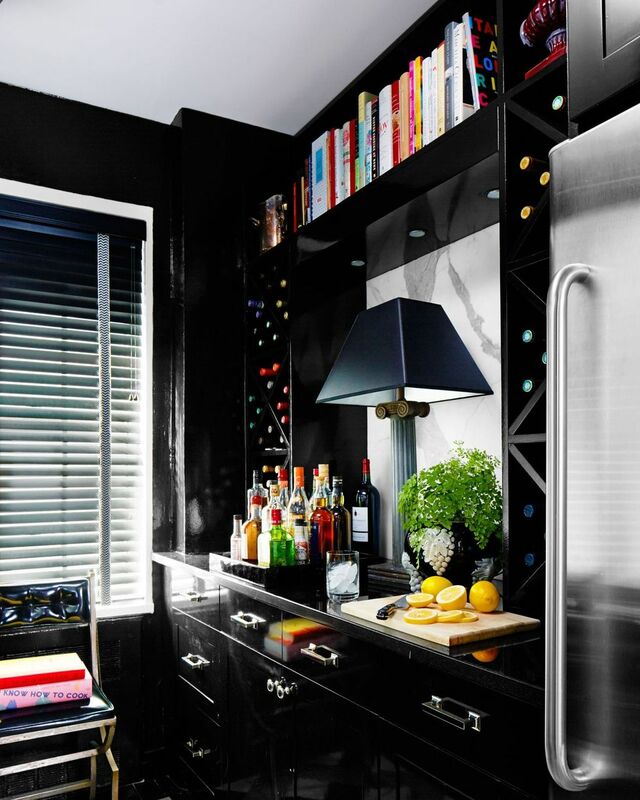 Black is the ideal color for a kitchen if you want to add a healthy dose of drama to the area. 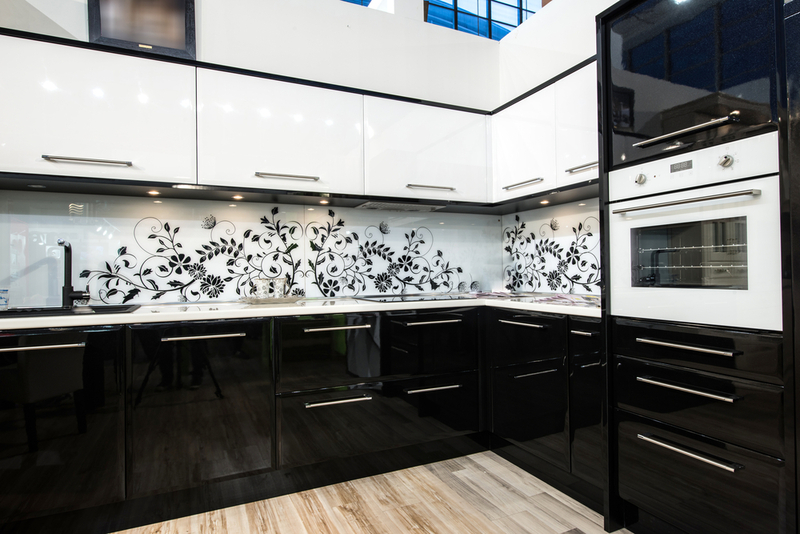 This kitchen combines a glossy black coating with nickel hardware making a perfect match for a dramatic look. 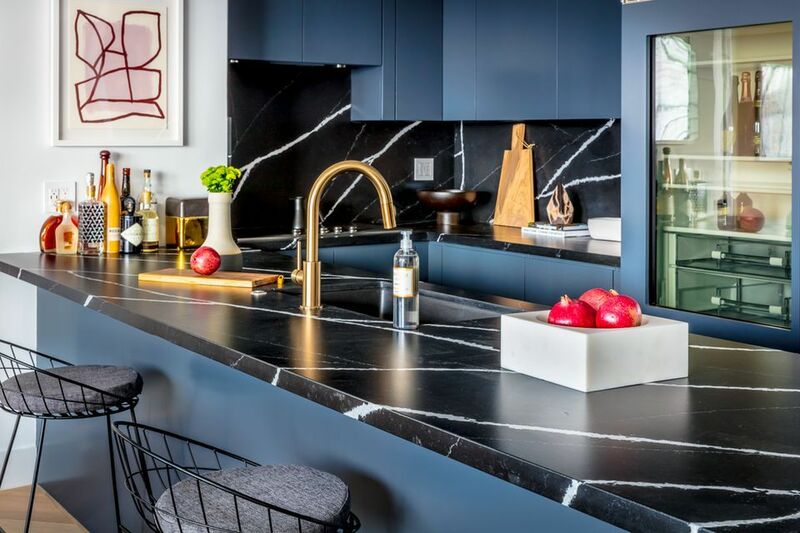 The black here can feel a little too overpowering, but you can select only a specific spot of your kitchen, such as the bar, to give it a luxurious makeover. There are many innovative ideas that went into the creation of this black kitchen. Sleek cabinets coupled with elegant marble countertops form an eye-catching contrast. The main highlight is the stylish effect provided by the use of patterns like the geometric tile backsplash and the frame of the brass pendant lights. These lighting fixtures stand out in the room considering the splash of gold against a monochromatic backdrop. A color blocking effect is obtained for this kitchen with the help of black that makes here a powerful statement through the kitchen island. The beautiful lines of the main elements of the kitchen are enhanced with some texture from the marble backsplash. The easiest way to describe this black kitchen with brown accents would be modernist and comfortable. 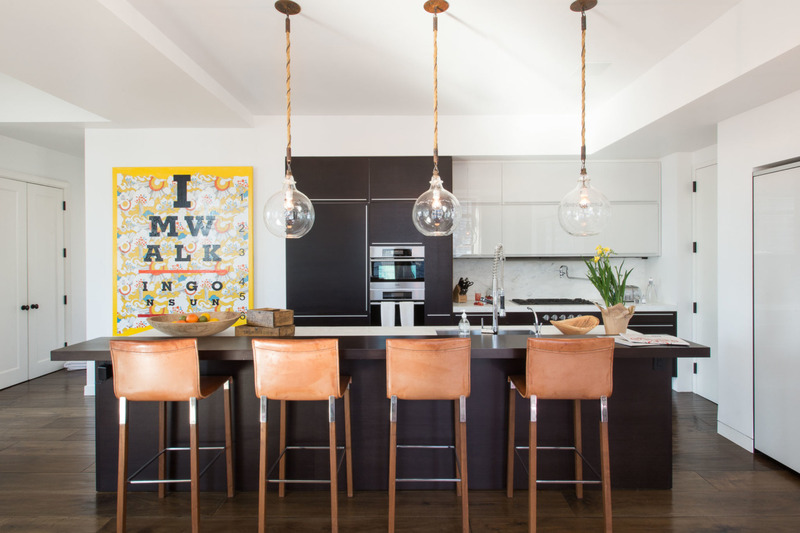 The black kitchen island makes here a dark statement and provides an ideal backdrop for the leather bar stools which add a sense of warmth to the overall area. Continuing with the luxurious theme, you can notice the charcoal quartz countertop and the elegant marble backsplash. One of the simplest methods to redesign the kitchen without too much effort is to make some slight adjustments to the color scheme. 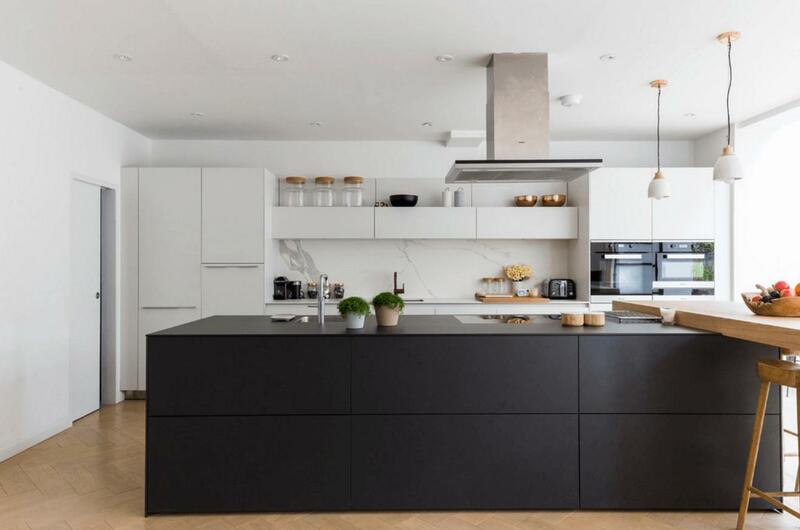 This clean contemporary kitchen offers a striking visual impression, but if you look closely at the design elements, you will notice how designers simply created a classic kitchen with a black twist. Take those old natural cabinets and replace them with crisp black models, and you’ve got yourself a fresh kitchen makeover. For a serene and elegant look, combining black and blue shades seems like an inspired choice. The modern style of this black kitchen is accentuated with some colorful elements like the gold faucet to make it feel like a more welcoming space. This is because the black marble and stylish cabinets exude a particularly dramatic aura. 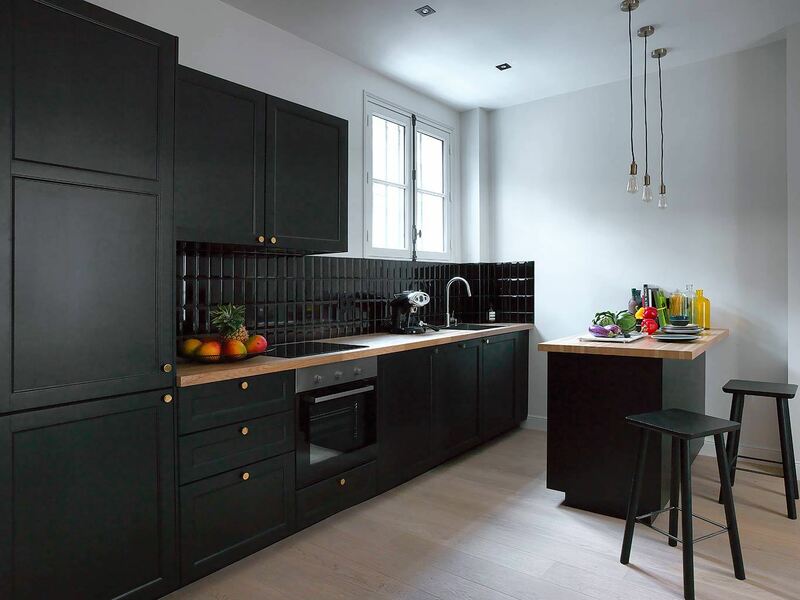 If you’re unsatisfied with the look of your raw plywood cabinets, a jet-black makeover can represent the perfect solution to rejuvenate the look of the kitchen. The black plywood cabinetry here offers a crisp aesthetic with minimal effort. This is the power of matte black paint to enhance any kitchen with some fresh style. Having a completely black kitchen can seem too extreme for some people’s tastes. You can enjoy the glossy elegance of black elements in a kitchen while still maintaining some colorful vibes. Take a look at the stylish effect achieved by this set of cabinets that come with different colors. 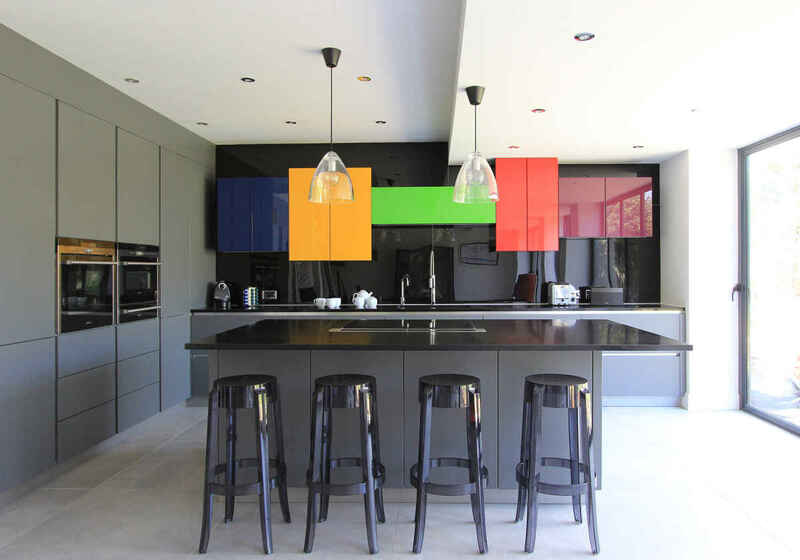 The result is a vibrant rainbow contrast against the black cabinets and steely gray base. This kitchen conjures up feelings of dark elegance considering the moody black wall and tall cabinets. On the gray kitchen island, a black quartz countertop completes the overall impression of sophistication while creating some necessary contrast. 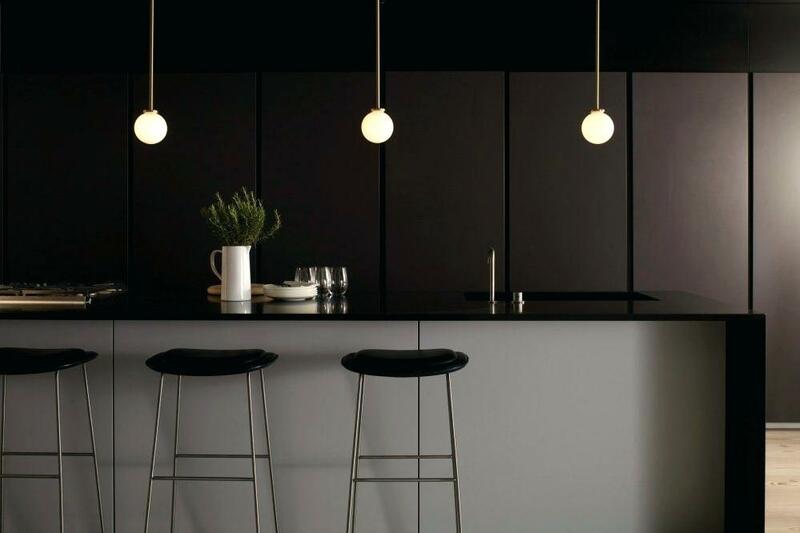 Simple globe pendant lights provide illumination in the most unobtrusive manner possible. With a few well-chosen elements, you can break up the moodiness of a black kitchen with some retro style. The cherry red stove makes a bold statement in this predominantly monochrome kitchen. A few other red accents complete the overall theme while the modern elements maintain a fresh look so as not to create the impression of being stuck in time. 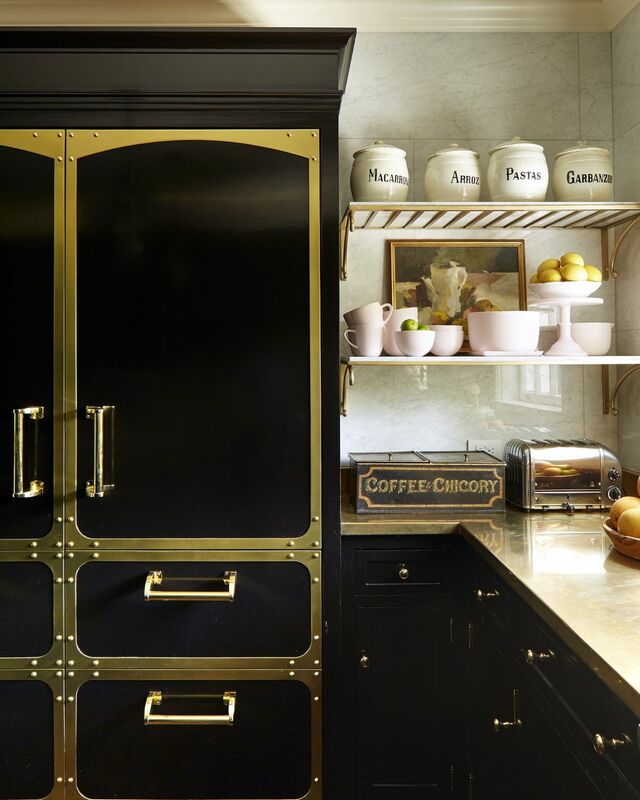 Black kitchens with brass elements can look fabulous when done right. This is a good example considering the luxurious look of this fridge which matches the metallic countertops. The gleaming power of the counter and hardware take the dramatic feeling of a black kitchen to a new level. Some soft orange lights placed under the cabinet can enhance the look of your black kitchen by bringing attention to the backsplash. They’re also helpful to illuminate your work area. In a similar manner, the kitchen island benefits from stylish dome lights that replace the usual choice of pendant lights. The only downside is that you have to sacrifice some countertop space. Modern kitchen interior. 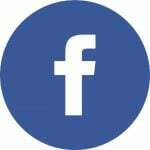 Render image. 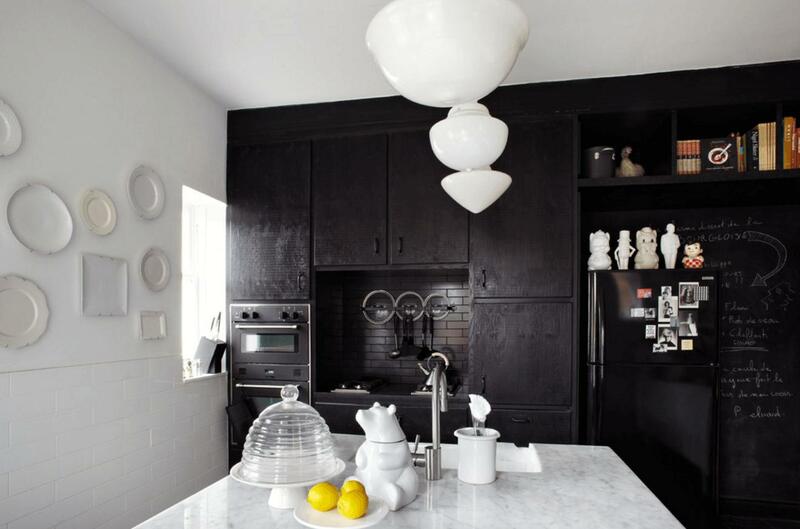 A black color palette can look great even when you’re designing a kitchen in a more cramped place. This L-shaped kitchen comes with wood surfaces on both the dining table and countertop. The color scheme is simple, but elements blend well together creating a harmonious and welcoming look even in this small space. 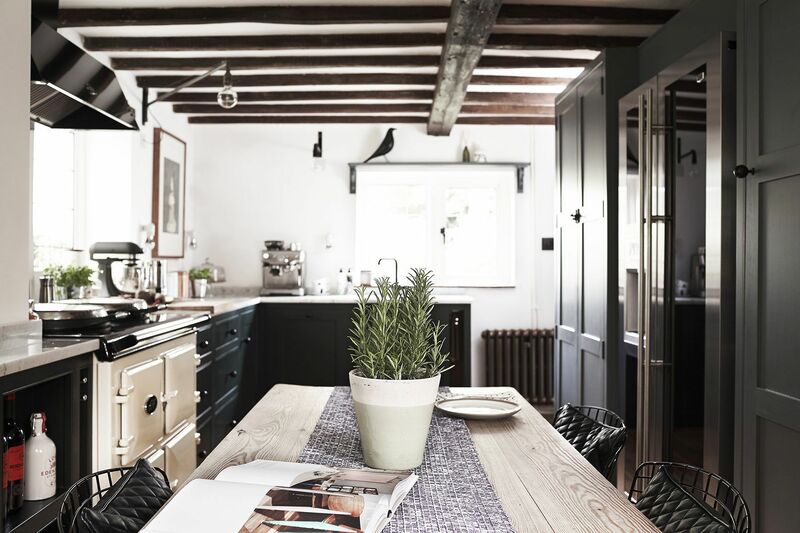 When planning to remodel the kitchen in this cottage, the interior designer tried to bring a fresh flavor and make a functional kitchen but without sacrificing the warmth and personality of the room. The result is truly stunning considering the lovely mix of rustic and modern elements. This is the kind of farmhouse kitchen that even a modern family can use comfortably. 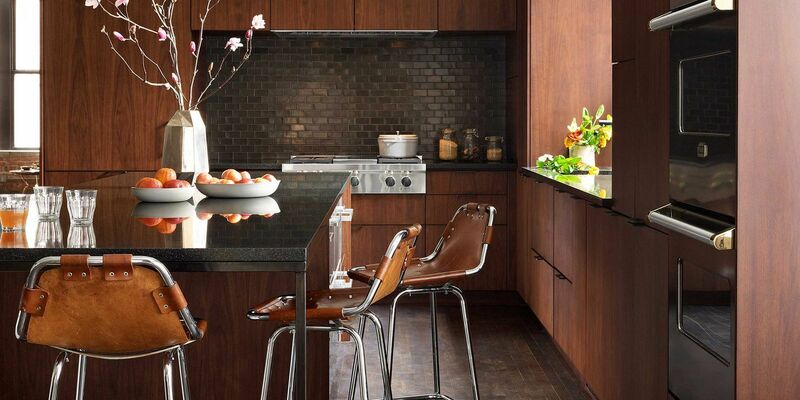 Deep modern hues envelop this elegant kitchen with warmth. The main highlight here is the backsplash that makes use of dark gunmetal tiles for a luxurious effect. 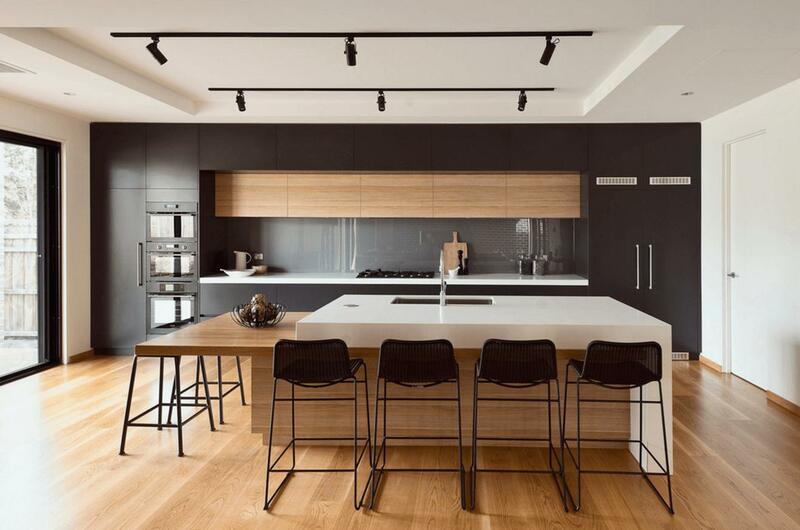 While rich wood tones predominate in this kitchen, the black accents take the sophistication to a new level. The kitchen island, in particular, looks amazing with its black granite countertop. 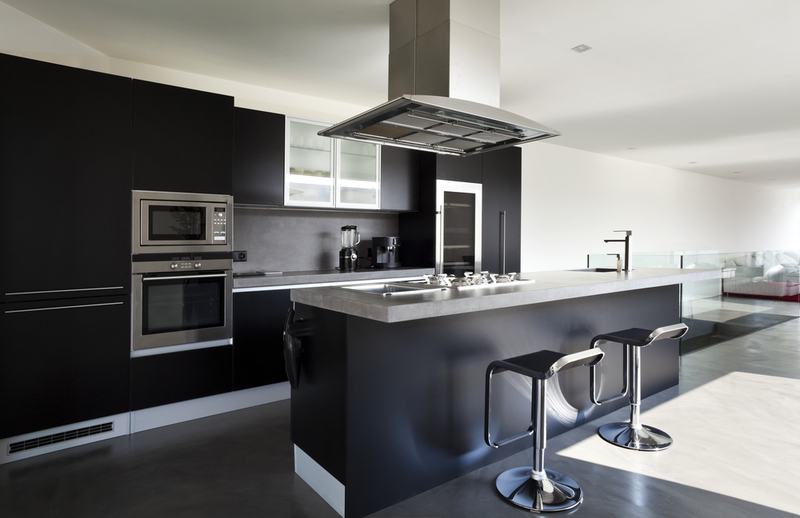 Having an imposing element in a black kitchen can pay off if you wish to make a bold statement. In this kitchen, the jet black range hood offers some luxurious vintage vibes together with copper cookware against a clean subway tile backdrop. 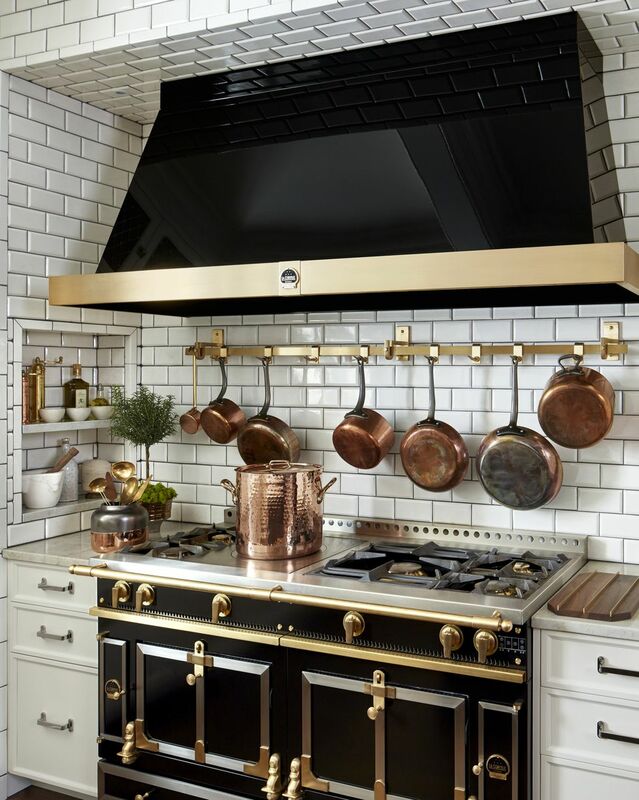 The brass elements of the hood match the look of the stove hardware as well as other gold accents from accessories.